The KWF’s philosophy of Karate is that its roots are are based in Bujutsu. At a time when Karate is becoming turned increasingly into a sport, the KWF will never stop its commitment to pursue Bujutsu Karate that develops the ability to deliver a killing blow and to defend or attack in an instant. We call this the ability to perform "Ippon Waza." We accomplish this using the following methods and principles. By forging basic technique or Kihon within Kata, we then train to develop our Kihon technique and movement to the ultimate extreme. Then finally, when this is mastered it becomes an effective Kumite technique. The KWF believes that Kihon, Kata and Kumite are represent a trinity of elements that are united as a single whole. Yahara Sensei was born on April 4, 1947, in Ehime prefecture. After graduating from Kokushikan University, he became Kenshusei, or junior instructor, in the Japan Karate Association. He rampaged through the world, monopolizing the high rankings in many tournaments, establishing legendary fame. Known for his leopard-like carriage, beautiful jumping techniques and adaptations, his unique karate style fascinated karateka all over the world. 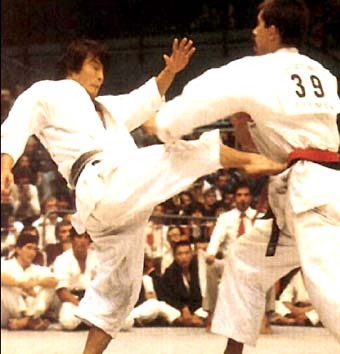 He met Yohji Yamamoto, an admirer of his "killing blow" karate, and in April 2000 he established the Karatenomichi World Federation to develop further his idea of karate. 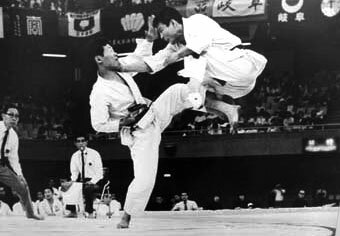 The concept behind the Karatenomichi World Federation is that the essence of karate is technical, and that exactly this is where karate starts. His karate philosophy is based on the conviction that karate is an art dedicated to developing ippon technique- the ability to deliver a single killing blow, and that Budo is founded on the ability to stake one’s life in a split second executing an offensive or defensive technique. We strive towards these goals, which are very different from the types of sports karate that are increasingly commonplace.